ABC News first reported concerns in 2009; FBI: Toyota "put sales over safety." 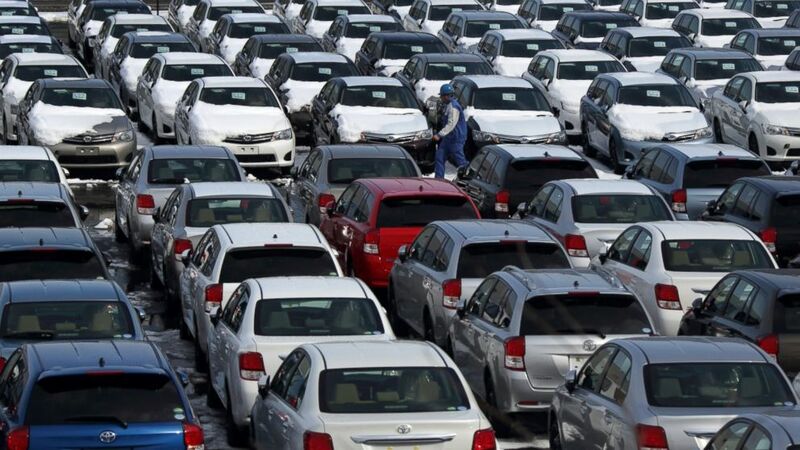 camera (Tomohiro Ohsumi/Bloomberg/Getty Images) Toyota Motor Corp. vehicles sit parked ahead of shipment outside the Central Motor Corp. plant in Ohira, Miyagi Prefecture, Japan, March 7, 2014. Toyota “put sales over safety and profit over principle,” according to FBI Assistant Director George Venizelos. ABC News first reported the potential dangers of unintended acceleration in an investigation broadcast in November 2009. The report said hundreds of Toyota customers were in “rebellion” after a series of accidents were apparently caused by the unintended acceleration. Two months before, Highway Patrolman Mark Saylor and three members of his family had been killed after the accelerator in his Lexus had become stuck on an incompatible floor mat. Saylor was able to call 911 while his car was speeding over 100 miles per hour and explain his harrowing ordeal right up until the crash that ended his life. At the time of the first ABC News report, Toyota attempted to assure its drivers that the incidents of sudden acceleration without warning were solely caused by floor mats becoming stuck on the gas pedals or driver error. But already other customers were complaining of similar problems with sudden acceleration, but some had nothing to do with the floor mats and they maintained they weren’t to blame either. ABC News published dozens of reports in the following months as Toyota said it investigated and announced massive recalls to address the accelerators being stuck under floor mats – repeatedly assuring drivers that the problem had been taken care of. But today Toyota admitted that the recalls did not cover all the cars they knew were in danger and said that they also concealed another cause of sudden acceleration they had found during their investigations – “sticky” pedals, which refers to the accelerator getting stuck partially depressed. Toyota only announced the issue with the “sticky” pedals, along with another massive recall, just minutes before an ABC News report on “World News” in January 2010 told the story of one driver whose Toyota Avalon took off suddenly on the highway. The driver, Kevin Haggerty, credited ABC News with saving his life because he had seen a previous report that described what to do in the event of sudden acceleration. By shifting back into neutral, and back into drive when necessary, Haggerty was able to prod his broken vehicle to the dealership, where he said employees there saw that his problem with unintended acceleration firsthand had nothing to do with his floor mat. However, Haggerty maintained that his sudden acceleration problem was not caused by a sticky pedal either. Regardless, today court documents showed Toyota knew about the sticky pedal problem in other Toyota models months before the recall and decided not to disclose it to regulators or the public. For other drivers, it was already too late. In addition to deaths like the Saylors linked to unintended acceleration, a Minnesota man was serving an eight-year prison sentence for vehicular manslaughter when evidence emerged suggesting he could have been a victim of Toyota’s acceleration problem. After serving two years in prison, Koua Fong Lee was released and charges against him were dropped in 2010. Earlier that year, an unidentified Toyota employee appeared to realize the dangerous game the company was playing. “Idiots! Someone will go to jail if lies are repeatedly told. I cannot support this,” the unidentified employee said after a meeting between Toyota and regulators in January 2010, according to court documents. Instead of jail, the company is now on the hook for the massive $1.2 billion fine, which U.S. Attorney General Eric Holder said was the largest penalty of its kind for an auto manufacturer. The money is due by March 25. “Toyota confronted this public safety emergency as if it was a public relations problem,” Holder said. A senior Justice official added that Toyota made "blatant misrepresentations" in what he called a classic case of corporate culture that favored the seemingly easy way out instead of paying the cost and doing the right thing. "The cover up is always going to be worse than the original sin," the official said. “Entering this agreement, while difficult, is a major step toward putting this unfortunate chapter behind us. We remain extremely grateful to our customers who have continued to stand by Toyota. Moving forward, they can be confident that we continue to take our responsibilities to them seriously,” Reynolds said.